Today, a group my friends, including a couple of new ones, came out to help me with a project that can only be described as me biting off much more than I can chew. I knew this project was ambitious, but now I realize what a gross understatement that is. The morning was off to a good start. I began by taking inventory of all the parts and thankfully everything seemed to be present. As people started arriving I was able to hand off inventory duty to Peter and focus on greeting and directing. 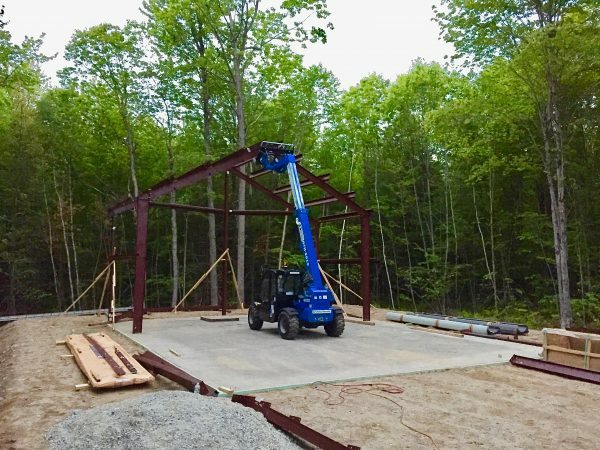 Peter and I studied the instructions and decided to lay out the steel columns and rafters in preparation of erecting two end-wall and two A-frames. 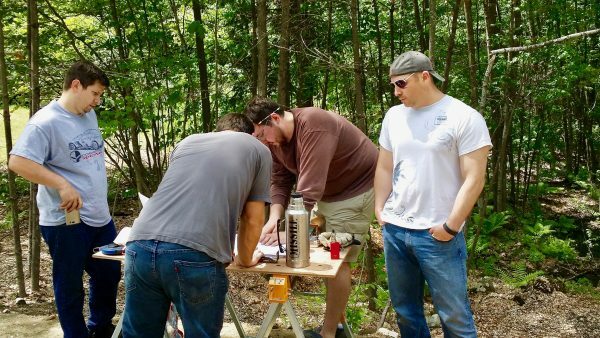 At this point I was starting to feel a little unsure about what went where, but thankfully Peter, armed with architect training and a patient demeanor, helped me read the plans. 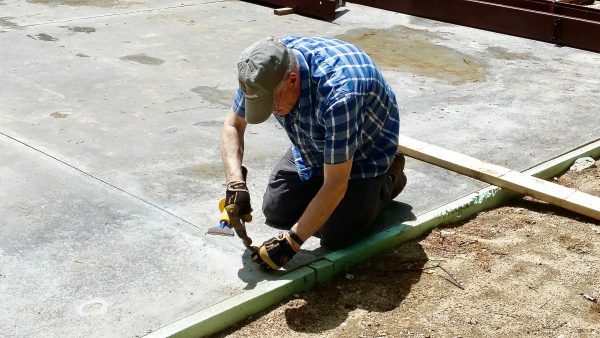 Meanwhile, Alvin went around with a hammer and chisel, smoothing out the concrete where the columns would be bolted down. Finally we were ready to get to work. Everyone began moving columns and rafters into place. They each required at least two people to carry, some as many as four, so we were glad to have so many people at this point. Before long we were assembling an A-frame. We then realized we really needed to erect the end-wall first, so we then disassembled the A-frame and focused on the end-wall instead. 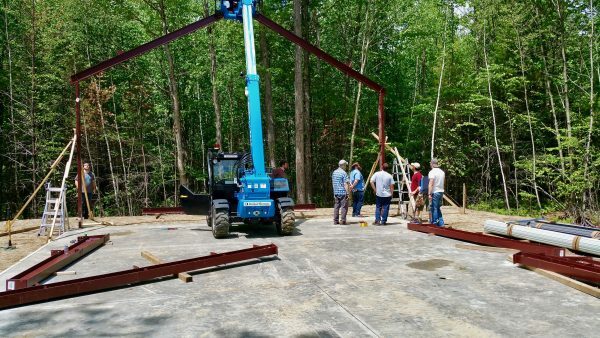 Once we got the outside columns and rafters together, we lifted the center into place with the forklift while supporting the corners with four guys per side. 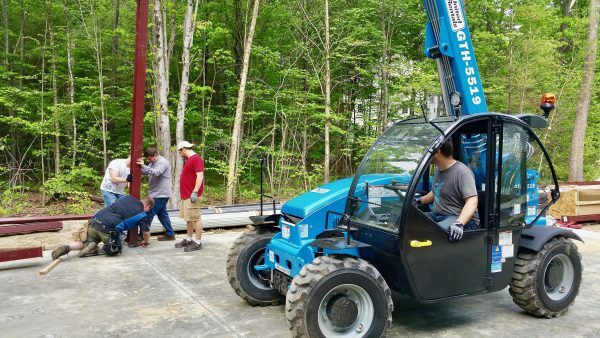 We bolted the columns into place, and checked to see how stable it was by pulling the forklift back a bit. As the forklift lowered, the entire arch waved back in forth, clearly extremely unstable and ready to come down on our heads. 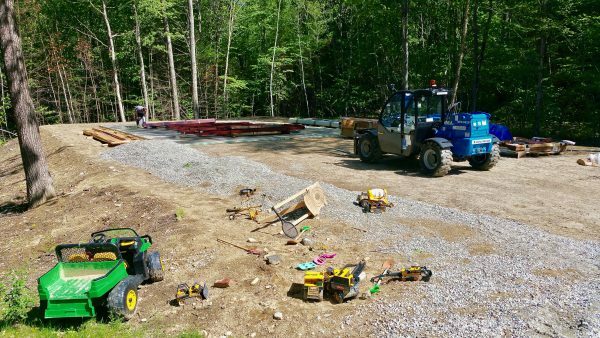 We put the forklift back into a supportive position and got to work on temporary supports. Next we added the center column, which made a significant difference in the stability as well. It turns out, these structures are very flimsy until they are nearly completed. Climbing up on the ladder, for me, was pretty uncomfortable. After a couple of cautious trips up and down, Adam volunteered to get up there and finish the job. 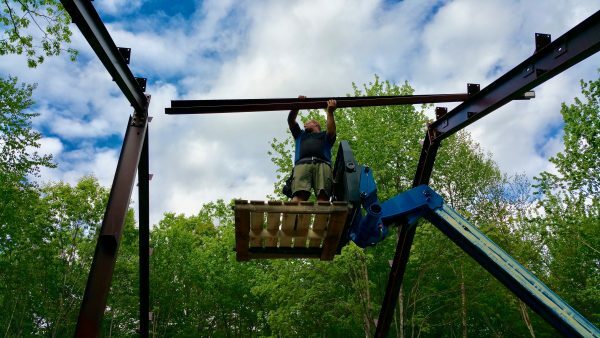 To everyone’s amazement, Adam shot up the ladder like a bolt, man-handled the beam into place 20ft in the air, and came back down just as fast. His comfort with heights would come in handy later on, but for now it was simply impressive if not scary. However, once we got it into place, something seemed wrong. 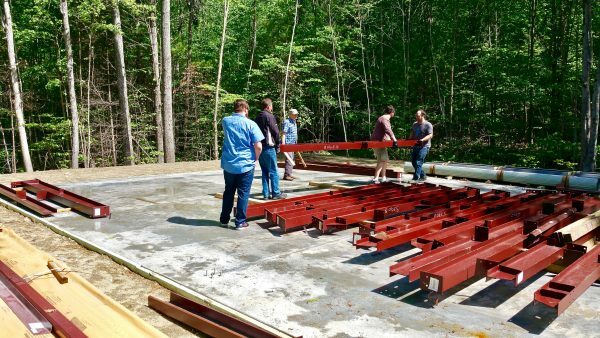 After a little bit of measuring and studying of plans, we realized that when the concrete finishers had moved things around, some of the lag bolts ended up getting set in the wrong place. I’m officially starting to freak out. But then, Adam busts out a giant reciprocating saw, cuts off the lag bolts, grabs a giant drill, makes new holes in the right places and drops special bolts into the concrete that set when you pull on them. Disaster averted. After enduring this early failure, we ate lunch. My wife and her friend had spent all morning preparing an amazing meal. The entire group sat around the table together and enjoyed a well deserved break. 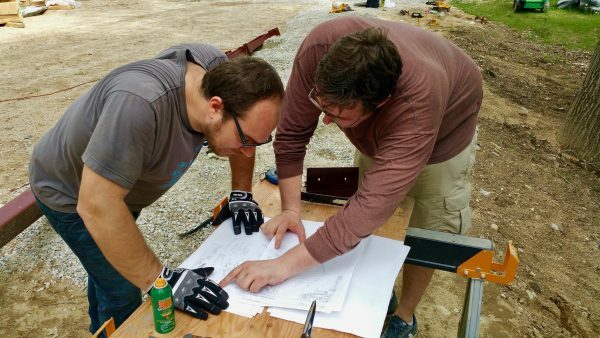 Back at the job site, with a new found lack of confidence, we returned to the plans and decided what to do next. Feeling ready to proceed, we started reassembling one of the A-frames. Once again, we lifted the center with the machine while supporting the corners with multiple people on each side. But once again, something was wrong. Another set of bolts in the wrong place! Quickly, Adam leaps into action and saves the day again. Another disaster averted. At this point, I’m realizing that Adam came prepared, and I did not. Having survived this far, we took a break and ate some pies, compliments of my wife and her friend. A few people needed to head out, but we still had enough people for the next steps, so we headed to the job site and got back to work. 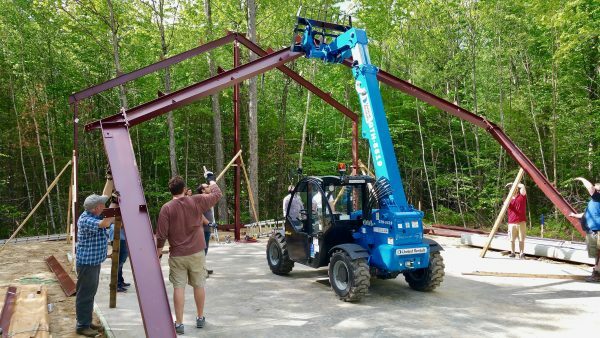 To get these giant arcs to be stable, we had to get the purlins attached. The sides went quickly enough, as they were within reach using a ladder. The top purlins, however, were quite a challenge. 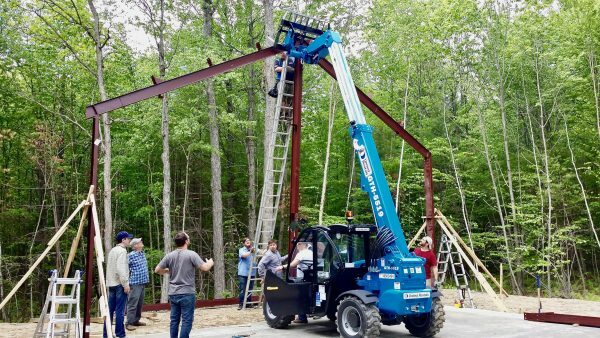 As we all discussed how to get a giant steel purlin bolted into place 20ft off the ground, Adam volunteered to stand on a forklift-supported work platform, also known as a flimsy palette, so long as I was driving the machine. 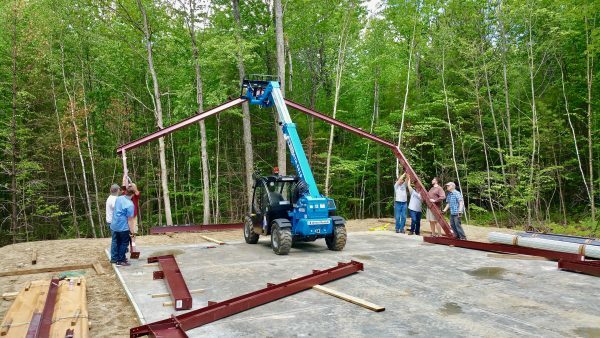 While Adam risked life and limb, manhandling purlins into place, I ran the machine, Peter and Dave lined up materials and Alvin lined up hardware, keeping the operation going smoothly. This is when we really hit a stride, and for perhaps the first time today, I was having a lot of fun. 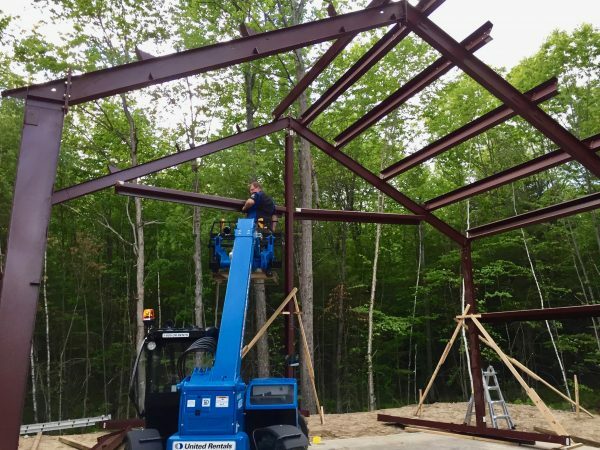 As the sky became dark, we secured the last purlins and cleaned everything up. As added security, I put the forklift in position to prevent the structure from moving overnight. For dinner, we ate the remaining food from the feast we enjoyed at lunch and called it a day. Dave stayed over and we relaxed a while playing Zelda before passing out from exhaustion. Throughout this process, we many encountered issues. Many were due to me not being prepared or not following the instructions correctly. As my stress level was peaking and I began feeling sick to my stomach, my friends stepped up and made things happen that I simply couldn’t have done myself. Adam, Alvin, Andrew, Brett, Dave, Joe, Lindsey, Liz, Macy, Mark, Marybeth, Melissa, Peter and Will, thank you so much for the sacrifice of your time and effort to make today happen. Your generosity came at a time when I needed it most, and is deeply appreciated. Hopefully tomorrow will be a productive one.